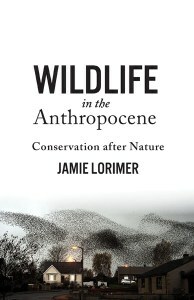 I have posted to Jamie Lorimer’s work (Oxford, Geography) before, but the University of Minnesota Press just released his new book on Wildlife in the Anthropocene. In Wildlife in the Anthropocene, Jamie Lorimer argues that the idea of nature as a pure and timeless place characterized by the absence of humans has come to an end. Offering a thorough appraisal of the Anthropocene—an era in which human actions affect and influence all life and all systems on our planet—Lorimer unpacks its implications for changing definitions of nature and the politics of wildlife conservation. Wildlife in the Anthropocene now published – I have a copy on order.